I find life most satisfying when there are many balls in the air. 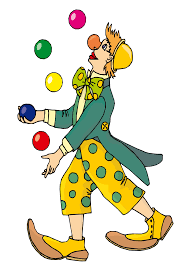 Y’know those jugglers who seem to do it so effortlessly? Well, that’s not me: I stress and fret at every turn, but if I’m not creating classes, writing, preparing, building, imagining I stress even more. I identify with the clown pictured above. I think I even have those pants. Plowing forward, five balls in the air… yup, that’s been my summer.